Birds take center stage, and it's you who gets to enjoy a spectacular view of the action with this simply luxurious residence. 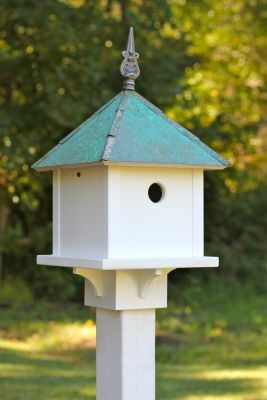 Classic design, featuring four-square symmetry topped by verdigris copper roof and cast iron finial, makes this home a winning addition to any yard or garden, with rugged cellular PVC construction providing life-long delight. Opening: 1.5” dia.